The ACT-IR2000U IrDA USB adapter provides a bridge to the USB port of a desktop PC, allowing high speed 4M bps wireless data transfer for record synchronization, file back-up and network access. No external power is needed! 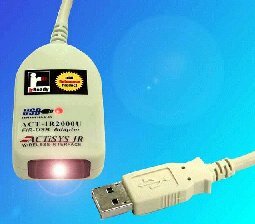 The ACT-IR2000U adapter is compatible with Windows 98 and Windows 2000. The IR2000U is bundled with the Windows driver, which allows wireless data communication from laptop, PDA, digital camera, cellular phone, data terminal, mobile medical units and other portable devices to a PC with plug-and-play simplicity. Multi-standard: Compatible with IrDA-1.0, 1.1; USB 1.1 specifications. An integral 4-ft cable with USB connector. USB bus power only. No external power required.